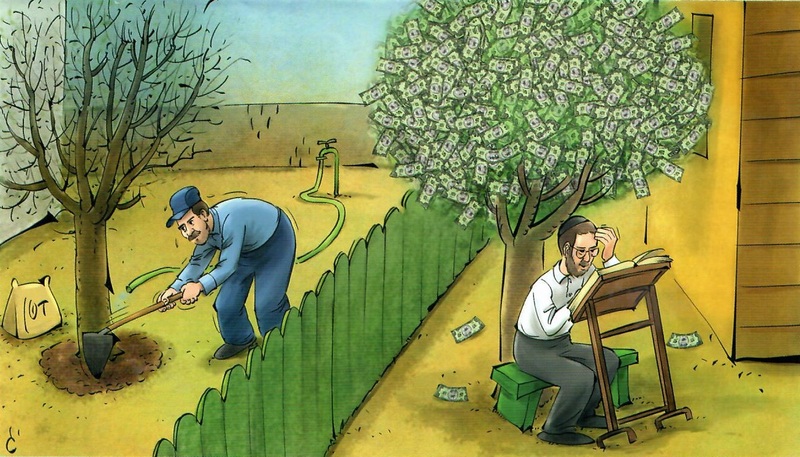 On the left is a hard-working farmer, whose tree is not producing fruit, despite him adding fertilizer to it. On the right is a kollel man, who doesn't need to put in any effort for parnasah - instead, money is just dropping off his tree! But it gets even more outrageous. The picture accompanies a dvar Torah about parashas Vayishlach. The dvar Torah is based off the account of how Yaakov went to the trouble of going back to get some small utensils. Chazal explain that for the righteous, who don't take shortcuts such as theft, their possessions are of great value to them, and they go to great efforts to look after them. The parasha sheet quotes this, and then explains that a few small utensils that have Hashem's blessing can therefore be worth more than millions of gold coins, and then segues into relating how for the righteous, their money miraculously pays for all their needs and they have plenty left over at the end of the month, whereas people with big paychecks lose all their money to "doctors and lawyers"! It continues to explain how the righteous don't need to put in regular efforts for parnasa, because they are aware that Hashem has in any case already decided on Rosh Hashana how much they will receive! It ignores the fact that Yaakov worked for many, many years to attain his prosperity. Incredibly, then, the parasha sheet has managed to twist the Torah's lesson about effort and responsibility for parnasah, into a lesson about how one doesn't need to put in effort! In the yeshivah world, they often say that Daas Baalei Batim is the opposite of Daas Torah. Well, here's a case where "Daas Torah" is not only the opposite of Daas, but it's even the opposite of Torah! The the parasha sheet quotes this, and then explains that a few small utensils that have Hashem's blessing can therefore be worth more than millions of gold coins, and then segues into relating how for the righteous, their money miraculously pays for all their needs and they have plenty left over at the end of the month, whereas people with big paychecks lose all their money to "doctors and lawyers"! It continues to explain how the righteous don't need to put in regular efforts for parnasa, because they are aware that Hashem has in any case already decided on Rosh Hashana how much they will receive! The page you posted says nothing of the sort. It doesn't mention Rosh Hashonoh and it states clearly 'we are not on that madreigoh". That's on the second side. Will try to get it. I was puzzled as well, after not seeing what you quoted in the parsha sheet you posted. What do you mean you will try to get it?! You brought the sheet home and scanned it. Did you scan it and throw it out? OK I just added it to the post. What you added does not say what you quote at all. With all due respect, you have completely distorted what it says. It brings some chassideshe ma'aseh where the rebbe said that. The article does not give this as general hashkofos hachaim, in fact made it clear on the first page that this is not for every body. You distort just as much as your opponents. R' Slifkin,this post is really frightening. For your personal bias to cause you to misread something is one thing. But for you to publicly post your hateful interpretation s and cause others to hate Jews is truly horrific. Not sure what your problem is. The parasha sheet says exactly what I reported it as saying. Maybe you read more into what I wrote than what I actually wrote. You seem pretty obsessed with the notion of hatred. Unknown, I believe Rabbi Slifkin understood the sheet properly. It did not say this is only for tzaddikim. What it said is that only tzaddikim are on the level to appreciate this fact. From the picture, it is clear they mean it to apply to a (more or less) average kollel person. It also is trying to insinuate that while the story involved someone who actually worked, just less than most people, really working is completely unnecessary. 1. "On the right is a kollel man, who doesn't need to put in any effort for parnasah." It does not identify anyone as being a kollel man, nor does it say there are people who dont need to put in effort. 2. "and then segues into relating how for the righteous, their money miraculously pays for all their needs and they have plenty left over at the end of the month"
The parsha sheet actually says "there are those who earn a very low salary, yet Hashem gives blessing to their money, and it comes out that at the end of the month they have a lot of SAVINGS i.e. having less expenses than usual. 3. "whereas people with big paychecks lose all their money to "doctors and lawyers"! 3. You leave out the next line which is "WE HOWEVER ARE NOT ON SUCH A LOFTY LEVEL"
4. "It continues to explain how the righteous don't need to put in regular efforts for parnasa, because they are aware that Hashem has in any case already decided on Rosh Hashana how much they will receive!" The parsha actually says a story of a specific person Rebbi Kalifa HaKohen who would not go to the market to sell his goods early in the morning but would sit and learn, and only in the afternoon would go to the market to sell. People were shocked by this behavior and would ask him why he waited, since by the time he gets to the market almost everyone will have done their shopping and he wouldn't be able to sell his goods. He replied that he wasnt nervous that the parnassa allotted to him by Hashem on Rosh Hashanah would be diminished if he came late to market"
5. "In the yeshivah world, they often say that Daas Baalei Batim is the opposite of Daas Torah. Well, here's a case where "Daas Torah" is not only the opposite of Daas, but it's even the opposite of Torah!" NOWHERE IS DAAS TORAH MENTIONED?! Honestly does this kind of thing not completely depress you? Did you actually read the sheets or are you just going by how RNS portrayed the message? I'm going to guess the latter since there's a big gap between what it actually says and the way he presents it. I don't know: if I had a money tree, I might consider sitting and learning all day, too. b. Conclude he's a fake because no good ehrliche yid would ever get in financial trouble? Of course money grows on trees. If not, why would banks have branches? The sheet also disregards the fact that Yaakov got those pachim k'tanim by working hard (almost no sleep) as a shepherd for 20 years. How about we teach children that if they work hard for a couple decades, they can retire if Hashem has seen fit to multiply their possessions such that they are independently wealthy at the end, the way he did for Yaakov? Funny how מעשי אבות סימן לבנים, but only when they are the "right" מעשות. Sure. But first they need to learn for 14 years in Yeshivah. That's 14 years from age 63 - 77. And many more years, likely almost all of them, before. Wait - how can the guy with the white shirt be a good Kollenick, if he lives right next door to a guy with a blue shirt, who looks like he's one of those American "Working haredim", or worse some type "modern" ideology. How strange! Papers distributed for children write simplistic lessons, without qualifiers and caveats. They write their message in stark absolutes, leaving no room for understanding or even sources. What else are children's publications going to do? How strange! Blogs written for adults write simplistic lessons, without qualifiers and caveats. They write their message in stark absolutes, leaving no room for understanding or even sources. It doesn't even make justice with the simple meaning of the verses, Yakov was returning from Aramaic with two heavy caravans loaded with all the wealth he earned honestly and through big toil with the help of God, and because he never did steal anything from Laban (or from the government) even little jugs were precious for him. What a devious way to learn Torah. The illustration show precisely in what a delusion people are lured, but when they are coming to beg tsedakah in Europe they are so confused that they didn't care in which part of the prayer you are, lomdei Torah? READ THE FRIGGIN PAGES BEFORE YOU COMMENT, it doesn't say anything like RNS presents it. Where does RNS get that the guy sitting under the money tree is a "KOLLEL man"?? The story the sheet brings down is one of someone who WORKS, just that he works less and has bitachon that Hashem will still provide for him. What an awful message, huh? And btw, I think it is safe to say that Yaakov worked day and night not because he felt all the work will give him a bigger parnassah than if he worked less. He did it because he felt that is proper behavior when working for someone else. If you work for yourself, it's a much different dynamic. The guy under the money tree is sitting and learning. He's obviously intended to be a kollel guy. And the message is that he doesn't need to work much, if at all, because money falls from heaven. DT: One question: Did you read through the parsha sheet? So let me get this straight. 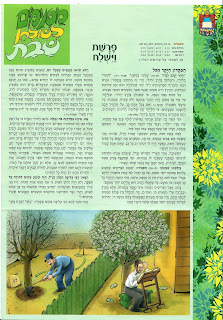 Although the picture doesn't mention that he's a kollel man (not sure what makes it so obvious since all he's doing is learning), and the actual article in the parsha sheet is about people who work, albeit less than normal, we should assume their intention is to convey that kollel people make tons of money without working, and then let's mock THEM for deducing from the parsha that kollel guys make tons of money even though the parsha is only speaking of someone who actually works. Anyone else see the irony in that? You are correct, I should have written that the person is someone sitting and learning, not that he is a kollel guy. But I think that the take-away message from the picture for the average kid looking at it, is that it refers to a kollel guy. What disturbs me most in the picture (didn't read the text) is that it idealises the money instead of the torah. A person should dedicate his life to torah if he appreciates spirituality and willing to give up the mundane aspects of "olam haze" - "כך היא דרכה של תורה, פת במלח תאכל ומים במשורה תשתה", and not because torah is going to make him rich. Is the child looking at the drawing fantasising about the dollars or a gishmak svara? "לפיכך כשמלמדין את הקטנים ואת הנשים וכלל עמי הארץ, אין מלמדין אותן אלא לעבוד מיראה וכדי לקבל שכר, עד שתרבה דעתן ויתחכמו חכמה יתרה, מגלין להן רז זה מעט מעט; ומרגילין אותן לעניין זה בנחת, עד שישיגוהו ויידעוהו ויעבדו מאהבה." It's one thing to promise some kind of reward, and to picture something completely illusory but clearly materialistic. Besides the illustration is somewhat ambiguous, published in a secular paper it would have hurt the feeling religious people. And the same could be said of the cartoon depicting a boy lost in a desert who find a phone but don't use it to save his life because it's a smartphone, the last vignette is a tomb with the mention hakodosh,I can't refrain to interpret it as a unconscious mockery. Is it not the same cartoonist? I have to say, after reading the sheet, that the message isn't as portrayed in the post. The illustration is rather unfortunate, because that does imply the wrong message entirely. The picture is absurd, but the text doesn't seem as bad. The story about R Kalipa (sp?) HaKohein is that he waited to business in the market until the afternoon (when there was less activity) because he was learning in the morning. He was confident that he would merit to make his fare share of money in the afternoon because he was using his morning time for a good purpose. I presume that if it wasn't working, then he would put in more hours. But it's an inherently problematic message. He's claiming that since his parnasa has already been established on Rosh Hashsnah, he doesn't need to put in the requisite hishtadlus. You trying to insinuate that the Amorah was wrong? I don't think that's the message intended. What this Rabbi claimed is that what he does in the afternoon is his requisite hishtadlus. One can debate the applicability to the general population, and one can even question the veracity of the anecdote. But, I don't think the message is a bad one. I didn't get that. I got "God is deciding and won't deduct for spending the first half of the day on Torah; whatever I get in the second half is what I deserved". IOW, if he lost a little by coming late, then that is what he deserved anyway because he would not be punished for learning. I don't think that is a wrong attitude. It didn't sound like if he was starving based on the afternoon work that he wouldn't change. It sounded like the townspeople were just surprised that he put learning ahead of a more profitable time slot. It isn't fair to project onto the text the implications of the illustration. The writer of the text very likely didn't know anything about the illustration. 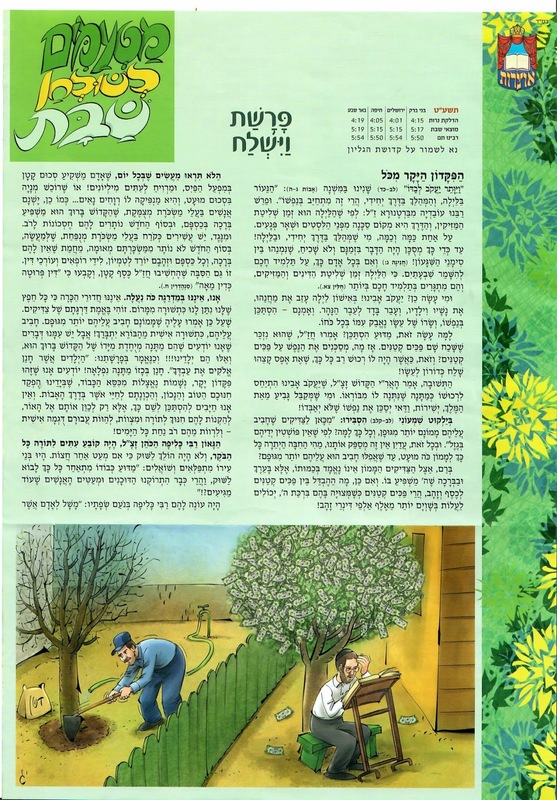 Keep in mind that the main take home educational message to any child getting these pages in shul is the cartoon, not the text. And the message in the cartoon even without the parshanut of RNS is terribly obvious. It is valuelessness of work VERSUS the value of Torah, not a healthy balance between them. This is the subliminal (and not so subliminal) message a child cones hone with. The educational organization responsible for choosing this cartoon should be held responsible. Here we go again. All too often, not just on this blog but almost any time there is an important argument about meaningful issues, one side, in the strong (and true) conviction that they are right, will misrepresent and/or exaggerate the claims of the other side in order to bolster their own position by making those claims seem as preposterous as possible. This is usually counterproductive, as it gives the other side an opportunity to prolong the argument by countering on technicalities without tackling the real issues. I am sure everyone reading this knows exactly what I mean. Yes, you are right that the importance of hishtadlus is criminally underemphasized and even denigrated in contemporary chareidi ideology. Yes, that cartoon is disturbing, and yes, this parsha sheet is somewhat representative of the propaganda of the aforementioned ideology. Please, please continue to fight that ideology in this blog with cogent arguments and apposite examples. Yet, this particular sheet does not quite say what you say it says, and nor is the true message of the torah’s story quite what you say. The true message of the torah here is not one of hishtadlus, important though hishtadlus is. Surely it is not proper hishtadlus for a multi-millionaire to endanger himself for the sake of not losing a few pennies. Many poor people go out of their way to save money by shopping at the cheapest stores they can find, while richer people save themselves the bother and shop at the most convenient and nearest stores even if they are a bit more expensive. Surely that is not a lack of hishtadlus on the part of the rich! How much more so when the issue is not one of convenience but one of not endangering oneself. The message here according to the sheet, is that tzaddikim recognize that every penny they own is a gift (in a metaphorical sense, not in the sense of not having needed any hishtadlus) from Hashem their King, given to them for a purpose, and is thus as precious to them as a large sum would be. 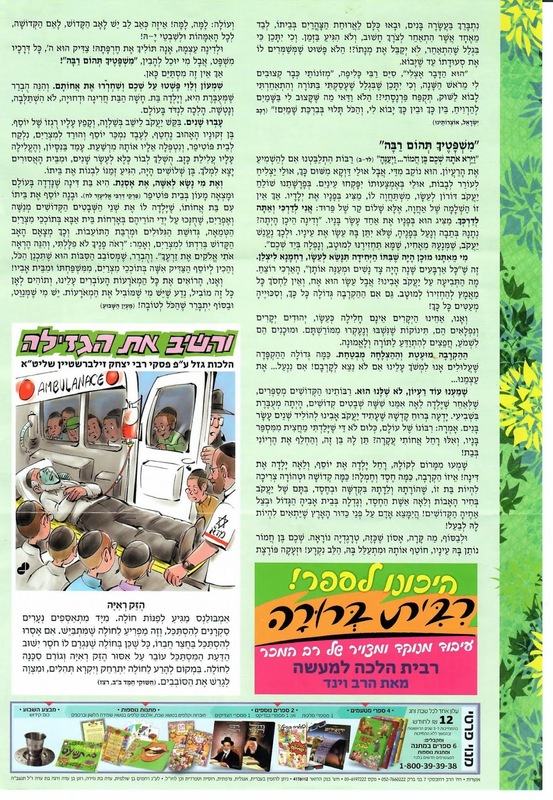 The sheet then brings a story about one particular tzaddik who would come late to the market and said that Hashem wouldn’t withhold his allotted portion because he was busy doing something as important as learning torah. The clear implication here is that this tzaddik AGREED that if he wouldn’t go to the market AT ALL, he WOULD LOSE his parnassah despite it being decreed on rosh hashanah! But he was aware of his madreigah and how much blessing Hashem would give him, and thus could minimize his hishtadlus to a certain extent. RDNS, misrepresenting things in order to better sensationalize your posts is counterproductive, as evidenced by many of the comments above, and actually undermines much of the good work you do on this blog. SOME people are very careful to follow the rules of the road but still get into accidents beyond their control. and SOME people, even though they drive drunk, make it home without a scratch. so would you support the message of a cartoon which portrayed a traffic agent getting run over next to a drunk driver steering clear of an accident? I`m sure all those Chareidi families living in the back corners of parking garages or in roach-infested tenements across Israel are enjoying this cartoon. "In the yeshivah world, they often say that Daas Baalei Batim is the opposite of Daas Torah. Well, here's a case where "Daas Torah" is not only the opposite of Daas, but it's even the opposite of Torah!" Yes - and it's ironic how the yeshiva world often resembles academia, with it's propensity for meaningless abstract sophistry and derision of seichel yashar and common sense. The cartoonist is Yoni Gerstein and he has a lot of previous with his pictures. 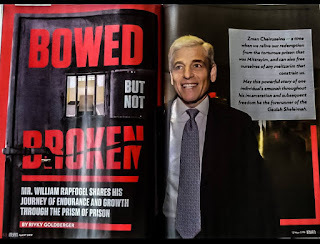 He has done political pictures as well as the justly lauded Mishnayos and books for R Chait. Remember years ago he managed to offend all Sefardi Jewry with a Sefardiphobic cartoon. you are a sad bitter man. I really feel bad for you. Paper money does come from trees. People in greenhouses should not throw bricks. Is the cartoon really that much different than what the Torah itself promises ? Need I cite the pasukim ? Based on all these comments, it seems that there is an argument over how to read the dvar Torah on the handout. But, like all divrei Torah, the overall message is found in the conclusion, and when you read the final concluding words of this dvar Torah it's clear what message it is wishing to convey. The dvar ends with a story that comes to the clear conclusion that effort for parnassah is meaningless because "everything is dependent on the blessing of heaven". Whether you want to read into the nuances of everything earlier in the article trying to state otherwise, these are the exact words that the article concludes with as its ultimate message. And then all you need to do is look at the image associated with the article. Just like the concluding message of the article is that "effort is meaningless", so too the picture represents that same theme. The picture, however, is far worse because for the kids who are looking at it, those same children that the dvar Torah says we cherish as gifts from God, they will be led to the false conclusion that money comes to you only if you are osek b'Torah, and that physical work is meaningless.